In 1974 Scientists sent a message containing the location of Earth in the solar system, our DNA structure and other relevant details into space and in 2001, we received an enigmatic response. In an effort to discover intelligent extraterrestrial life, Carl Sagan sent a broadcast known as the ‘Arecibo’ message into space via radio waves. The message aimed at ET was the most powerful radio broadcast ever beamed into space by mankind. In comparison, the signal sent out into space was a million times stronger that a typical television transmission. Directed to a star cluster located over 25,000 light years away, the pictorial message was sent in hopes that one day, we would receive a similar response. The radio signal included our planet’s location within our star system, core principles of math and science and the antenna that was used to transmit the signal, all characteristics that an intelligent alien civilization should understand. 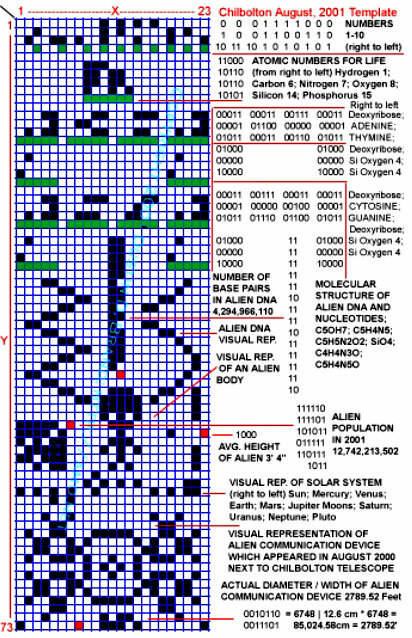 The message prepared by Carl Sagan and his colleagues also included information about our species; our physical appearance was included in the radio message as well as our DNA code. A few years after the signal had been sent out, people forgot about it. Then, 27 years later in 2001, a crop circle appeared shaking the scientific community. A pattern appeared on a crop field, next to the UK’s largest telescope and observatory, the Chilbolton –where the world’s largest fully steerable meteorological radar is located– which looked like a response to the 1974 broadcast. It was considered by many as one of the most impressive and important crop circles ever to appear on our planet, since this corp circle, unlike others, carried a message from space. While many dismissed the crop circle near the Chilbolton as another hoax, the analysis showed it carries a message or better said, a response from space. Describing a different solar system in the universe, the image of the sender, non-human DNA, and some microwave antenna, the Chilbolton crop-circle was the ultimate response we’d ever hoped for. Incredibly, just a year before the Extraterrestrial message was found, a crop circle which was in 2000 of an unknown shape appeared next to the Chilbolton. A year later the puzzle was put together, and we could see that the crop circle that appeared in 2000 was, in fact, a depiction of the microwave telescope used to transmit the signal to us. In 2001, three days after the mystery response appeared next to the Chilbolton; another crop circle was found depicting what seemed to be a face. According to bibliotecapleyades.net, the decimal equivalents of the binary code – were unchanged from the Arecibo original. But the atomic numbers of the elements composing the basis of Life had been altered: silicon, an element with an atomic number of 14, was added precisely in the correct sequence – between oxygen (atomic number 8) and phosphorus (atomic number 15). Because… in 1969, the late Ben Volcani – a renowned microbiologist at the Scripps Institution of Oceanography – discovered the crucial role of silicon in Carbon based Life. His work and that of his colleagues (like Charles Mehard, also at Scripps, and Edith Carlisle in the early 1970’s at UCLA) showed that the presence of silicon is critical in a variety of terrestrial life forms, as well as human cell structure: for instance, in the binding of the cartilage and mineral aspects of bones. Whether or not the crop circle that appeared next to the Chilbolton was, in fact, an alien response is still up for debate. However, many people are firmly convinced that not only is the Chilbolton crop circle of 2001 a real message from another intelligent alien civilization in the universe, but we receive similar message nearly every day. ‘Here is how we count from one to ten. Here are five atoms that we think are interesting or important: hydrogen, carbon, nitrogen, oxygen and phosphorus. Here are some ways to put these atoms together that we think interesting or important – the molecules thymine, adenine, guanine and cytosine, and a chain composed of alternating sugars and phosphates. These molecular building blocks are put together to form a long molecule of DNA comprising about four billion links in the chain. The molecule is a double helix. In some way, this molecule is important for the clumsy looking creature at the center of the message. That creature is 14 radio wavelengths or 5 feet 9.5 inches tall. There are about four billion of these creatures on the third plant from our star. There are nine planets altogether, four big ones toward the outside and one little one at the extremity. This message is brought to you courtesy of a radio telescope 2,430 wavelengths or 1,004 feet in diameter.